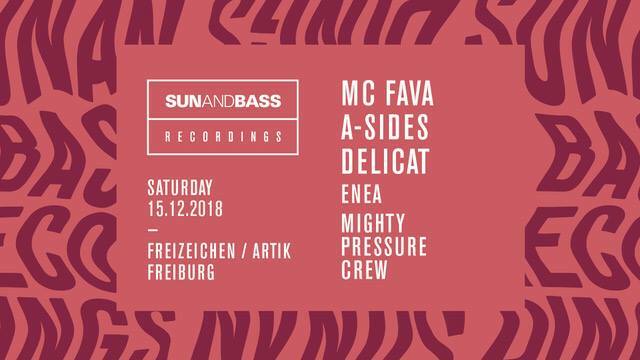 Sun and Bass Records stands for a unique Vibe. The ethos of the label is to release music with both a personal touch and to represent the spirit of the event. So even if its cold outside you will feel the Sun delivering some smiles to your faces. A talented and open minded vocalist with over 10 years experience, Fava knows when to support a DJ on the mic and when to to let the music speak for itself. With gigs all over Europe, highly respected residencies at Fabric and Sun & Bass and collaborations with producers like Klute, Seba, B-Complex & Nymfo, Fava is rapidly becoming one of the go-to artists for quality vocal delivery. Delicat from Berlin is one of the heads behind the Sun & Bass festival in Sardinia and founder of the Sun & Bass label. Since 2003 the festival is hosting the biggest DnB acts and it’s regarded as one of the best DnB festivals in the world. His dark and intensive music is rounded by hypnotizing deep sounds which is exactly what this party is going to be! ENEA, driving force behind the Freiburger Label Beatalistics likes to play deep and souly DnB. A lot of the tunes he plays are selfmade, some of them where released on, to name only one, LTJ Bukems legendary label „Good Looking“. Member of the well known VAG CREW, which is organizing outdoor raves and the „Entgleisung“ events, Lunatiq is definitively an artist to keep an eye on. He usually plays dirty synthesizer sounds, to be concrete a lot of Jump Up and Riddim Dubstep and dark Neurofunk sounds but for this evening he is going to, once again, show his deep and soft side. The Mighty Pressure Crew are eight Dudes who share the love for Drum and Bass. With seven of them Djing they cover every Subgenre of DnB and play them with passion and love.